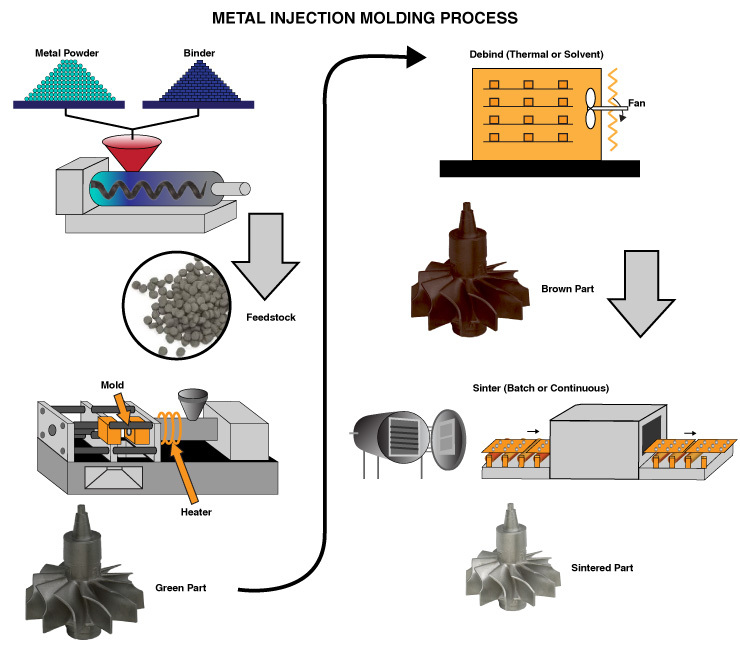 Metal Injection Molding (MIM) Process is a relatively new manufacturing process technology combining conventional Powder Metallurgy with Plastics Injection Molding. Metal Injection Molding overcomes the shortcomings of the traditional powder metallurgy products which is low density, inhomogeneous materials, low mechanical performance and difficult to forming thin-walled complex parts. MIM is suitable for mass production of complex shape, high precision, high-performance requirements of small metal parts. Sintered products not only have the same complex shape and high precision as the plastic injection molding products, but also have physical, chemical and mechanical properties close to the forging products. • First, metal powder is mixed with binder , and becomes granulated feedstock needed by injection molding machine. • Second, the viscous flow characteristics of the polymer is gifted with the mixture, and help shape of the cavity filled with powder and packed uniformity. • Third, the green part is debind and sintered. Some sintered products might need second densification process, heat treatments or machining. Not only has MIM products same plastic injection molding products as the complex shapes and high precision, but also as forging parts close to the physical, chemical and mechanical properties. Metal Injection Molding technology can meet mass production of small, sophisticated and complex three-dimensional shape. 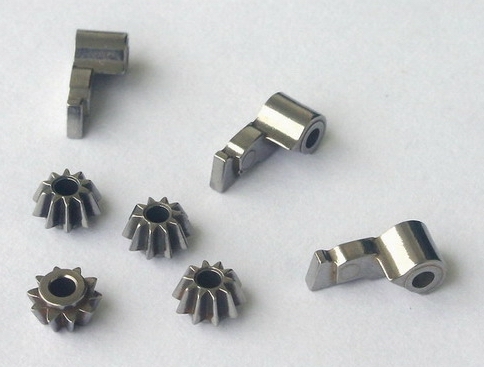 Metal Injection Molding technology as a high-quality precision components near net shape technology, has the advantages conventional powder metallurgy, precision machining and casting methods can not acquire. • Product quality stability, high efficiency, easy to achieve high-volume, large-scale production. Fe-based alloy steel, stainless steel, nickel-based alloys, tungsten alloy, carbide, titanium, magnetic materials, Kovar alloy, fine ceramics, etc..